It might not be as iconic as Pronto Pups, or as sweet as Sweet Martha's cookies, but the Minnesota Newspaper Museum does offer a unique experience for State Fair goers: a journey through time. Tucked away in the northeast corner of the Fairgrounds, the museum is only about the size of a living room. The space is dominated by intricate machines, buzzing with activity. These machines are still in working order, and they bring back sights, sounds and smells from the turn of the last century. "We simulate what a weekly newspaper in the 1930s might have looked like," explains Linda Falkman, the museum's director. She says that the flow of the museum is pretty similar to what it was like in the old days. "They produce the news on the Linotype machines. Then it was put over on the composing table. Then the very heavy form was put onto the newspaper printing press. And then there's a folder that folded them three times, which gives you the quarter fold that we have today," she said. Some of the machines are over 100 years old. The Linotype, which casts the newspaper text in lead bars, was invented in the late 19th century. The press is newer, it was made in 1924. 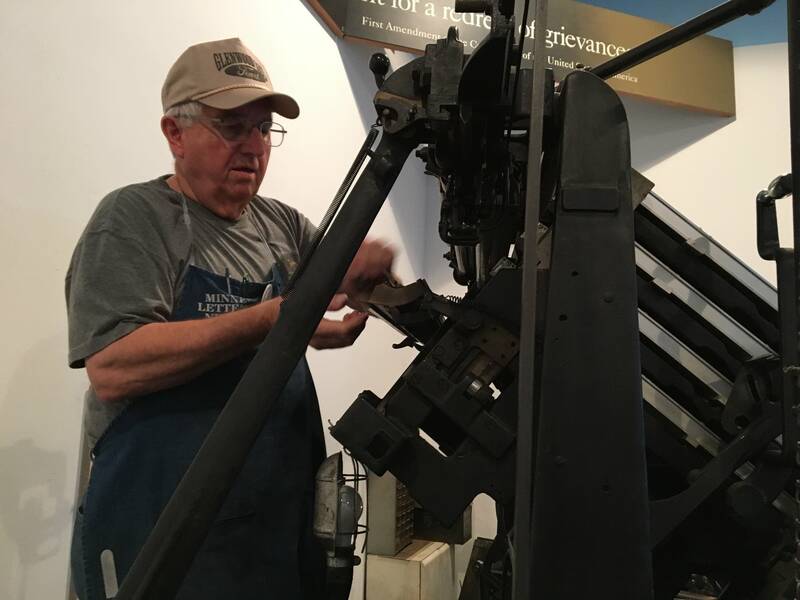 The volunteers at the museum, a mix of young enthusiasts and old pros, take good care of the machines, and they're able to churn out State Fair editions of the museum's own newspaper, hot off the press and given to visitors for free. But the museum is about more than just machinery; it also delivers a timeless message about journalism. To that end, the museum prints and hands out posters with the words of the First Amendment on them. "We think today more than ever, we need to get out the message of how important the First Amendment is to our democracy, and how important the freedom of the press is," Falkman said. Falkman says the museum is a symbol of what newspapers used to be, and what she wants them to be again: a connection between communities and the world around them.